They’re back! For the last several weeks, one could not help but notice the large white birds that were feeding on Rest and Schwartz Lakes or flying overhead sounding their unmistakable high-pitched honking calls. The Tundra Swans are back! They have returned from spending the last six/seven months in the Arctic breeding and raising their young. The Tundra Swan’s breeding range spans most of the Arctic and sub-Arctic tundra from Bristol Bay, Alaska, north along the Bering Sea coast, the Arctic Ocean east to Baffin Island, and south to the northwest coast of Quebec. The female tundra swan builds a large stick nest lined with moss and grasses on islands or hummocks found near lakes, ponds or marshes. There she lays around 4-6 eggs. She incubates them for 32 days while her mate (it is generally believed that Tundra Swans mate for life) guards the nest. The young chicks (cygnets) are protected from the cold and predators such as foxes and jaegers. They also must be protected from the swarms of voracious Arctic mosquitoes. If all goes well, the cygnet’s growth rate is very rapid and in September, after about 70 days, their weight may be 28 times the hatching weight. This growth rate is necessary because by early September the cygnets must be fully feathered and be able to fly long distances. Tundra swans winter mainly along the Pacific and Atlantic coasts of North America, from southern British Columbia to California and from New Jersey to South Carolina. Migration for the Tundra Swans generally begins in September and many times is done in two to three stages, no doubt because of the young who have just begun to fly. Tundra Swans migrate in family units made up of several families all combining in a single flock. Marshes adjoining the Great Salt Lake begin receiving Tundra Swans in mid-October as we did here at Ridgefield NWR. They begin to arrive at the Malheur NWR in S. Oregon from mid to late November and the swans are not present in great numbers on the winter grounds adjacent to the San Francisco Bay until early December. The Tundra Swans spend their winter on the water and sleep afloat. They are strong and speedy swimmers that take to the air with a running start, clattering across the water’s surface with wings beating. 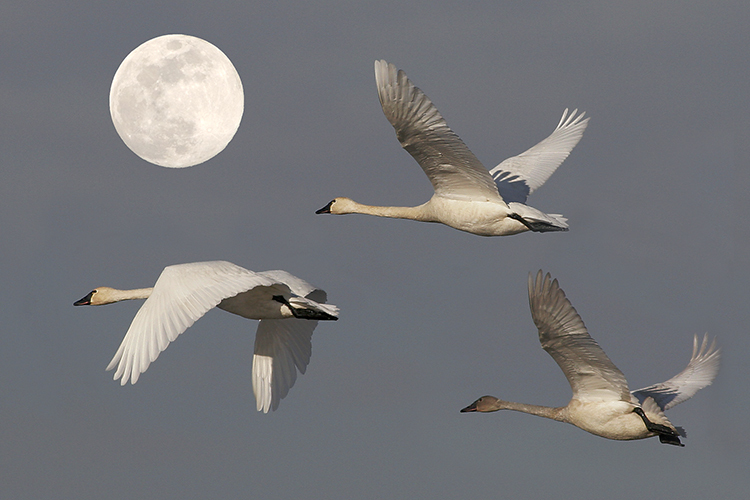 In flight, the rhythmic flapping of the swan’s wings produces a tone that once earned it the name “whistling swan”. They feed by dipping their heads under water to nibble on aquatic plants, roots and tubers. The Tundra Swans can be from 4 ft to 5 ft in length with wingspread up to 5 1/2 ft. In the wild they can live up to 20 years. 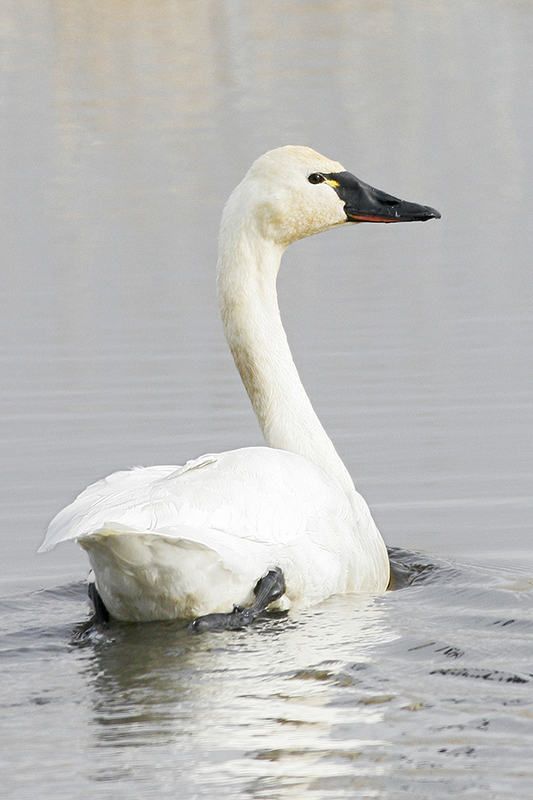 Many times the Trumpeter Swan is confused with the Tundra Swan. 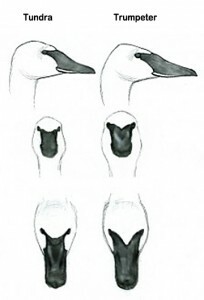 The Trumpeter Swan is a little larger, has a deeper, trumpet quality to its call, has no yellow on its bill (although 10% of the Tundra Swans have no yellow either), has its eyes more broadly connected to the bill than the Tundra, and has a longer straighter bill. Please see the Sibley pictures on the left comparing the Tundra Swan (left) and the Trumpeter Swan (right). Even though there are exceptions to the above, it is probably safe to say, at least at Ridgefield NWR, that the swan that you see there is a Tundra Swan. The Trumpeter is an infrequent visitor. Come out to the refuge and enjoy the beautiful, graceful Tundra Swans. While you are there, notice the thousands of other waterfowl and geese covering the lakes and fields, all making a splendid cacophony of sounds. Some of the unusual/rare birds that were sighted this past month are the Snow Goose, Eurasian Wigeon, Redhead, Sharp-shinned and Red-shouldered Hawks, Merlin, Baird’s Sandpiper, Sharp-tailed Sandpiper, Dunlin, California Gull, Barn Owl, Short-eared Owl, Black Phoebe, Northern Shrike, White-throated Sparrow, Evening Grosbeak, and the very rare Common Redpoll.